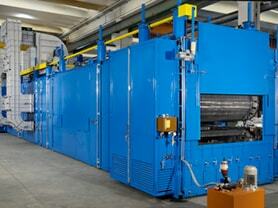 Curing Ovens for insulation materials production - CEBA S.r.l. Modular design manufactured to produce glass wool and mineral wool according to the request of the insulation materials market. The oven can be manufactured according to the following width of the final product: 1200 mm – 1800 mm – 2400 mm. Special ovens with change of width can be manufactured if requested. The ovens have been designed to minimize the consumption of natural gas requested by the process and to recover as much as possible the heat in the exhausted fumes. As rough idea of the performances of these ovens, each module (according to the width of the final product) produce up to 25 ton/day of good product and the total consumption is less than 200 kCal/kg of good product.